What’s going on with Amber Rose and BlacChyna? They reportedly unfollowed each other on social media after Chyna skipped Amber’s SlutWalk to go to the BET Awards. Amber Roseand Blac Chynaare stirring uprumors that they’re no longer friends. The speculation began when Chyna, 30, didn’t attend Amber’s annual SlutWalk on Oct. 6, opting instead to attend the BET Hip Hop Awards. They then unfollowed each other on social media, which was first pointed out by The Shade Room. The outlet also claims that they “have thrown in the towel”on their friendship. Fans quickly took to Twitter to comment on the rumored fallout. “Ain’t nobody friends anymore lol Not even Blac Chyna and Amber Rose. Damn,”@Mo_thepoetwrote. “So Blac Chyna and Amber Rose aren’t friends anymore. *whispers* I think Amber should’ve dropped her ages ago,” @asj519 tweeted.The rumors come as a surprise seeing as how these two have been practically inseparable for years. They’ve been taking each other as their dates to awards shows since 2015, and have even rocked matching looks on many of those occasions. 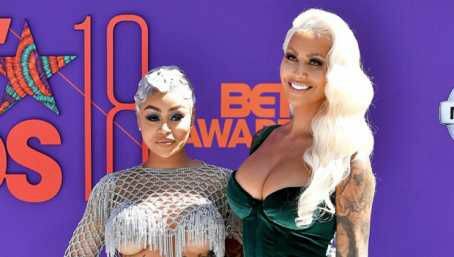 Earlier this year, Chyna and Amber walked the BET Awards red carpet together, where they shared a kissin front of the cameras.